Now that Quirk Books is adding zombies to boring old classic novels, I may be willing to expand my reading selection beyond comic books. 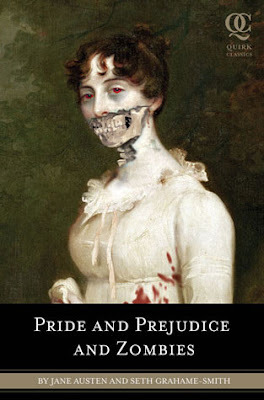 Pride and Prejudice and Zombies -- Pride and Prejudice and Zombies features the original text of Jane Austen's beloved novel with all-new scenes of bone-crunching zombie action. As our story opens, a mysterious plague has fallen upon the quiet English village of Meryton—and the dead are returning to life! Feisty heroine Elizabeth Bennet is determined to wipe out the zombie menace, but she's soon distracted by the arrival of the haughty and arrogant Mr. Darcy. What ensues is a delightful comedy of manners with plenty of civilized sparring between the two young lovers—and even more violent sparring on the blood-soaked battlefield as Elizabeth wages war against hordes of flesh-eating undead. Complete with 20 illustrations in the style of C. E. Brock (the original illustrator of Pride and Prejudice), this insanely funny expanded edition will introduce Jane Austen's classic novel to new legions of fans.